Nagas are serpentine beings who can assume either the form of a great cobra, a half-human half-serpent form, or even a fully human form. They are followers of Virūpākṣa, the heavenly king who guards the western direction and, together with the other heavenly kings and their retinues, are considered to be protectors of Trāyastriṃśa heaven at the peak of Mount Meru. Nagas are also protectors of the world and of the Buddha, Dharma, and Sangha. 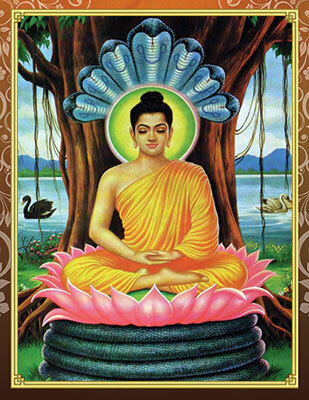 According to the Vinaya Sutra, once while Buddha Shakyamuni was meditating in a forest three weeks after he attained supreme enlightenment, a storm developed. Nagarajah Mucalinda, King of the Nagas, rose up and sheltered the meditating Buddha for seven days by spreading his seven serpent heads over the Buddha's head like an umbrella. offerings and give tachings to the nagas, obtained this terma or concealed text of the Pranjaparamita. As guardians of the world, the nagas take on the duty of watching over nature and benefitting beings within their sphere of protection. When human activity encroaches upon and causes harm to nature and the environment, the nagas' task becomes more difficult and imbalance is created. This gives rise to calamities such as storms and floods which are nature's way of restoring balance. accumulations of mantras officiated by qualified tulkus or lamas. Together with the proper sadhana, puja, and auspicious offerings such as fresh milk, the vase is then released into the ocean, lakes, rivers, springs, falls or other bodies of water. According to Karmapa Trinley Thaye Dorje, the benefit of the Naga vase offering is the accumulation of the material aspect of wealth, which is important so we can take care of and sustain both our physical bodies and the environment we live in. In doing so, we ensure our ability to continue our Dharma practice. Through the vase offering, we establish a harmonious relationship with the nagas who are holders of wealth and protectors of the world. As a result, when they are at peace, they can help develop resources and keep the natural resources intact. Harvests will be more bountiful, there will be less drought and natural disasters, and natural balance is restored. cultivating the bodhicitta mind, it is our wish for the Philippines to regain balance with nature, for calamities to be pacified, and for all sentient beings to enjoy peace and prosperity and attain liberation from suffering.